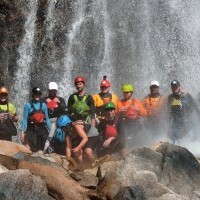 What a wonderful year it has been at Whitewater Adventures Nepal. 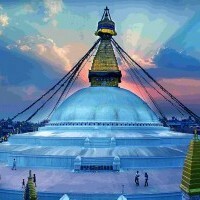 A fantastic season that has had many people come and enjoy spending time in the lovely country of Nepal. Whether it be mountain biking, trekking, whitewater rafting and kayaking, doing community work, meditation and yoga or cultural activities the response we have had from our customers this year has been outstanding. We would like to say a huge thank you to our wonderful staff and all the hard work they have put into make this year so great. The Easter multi rivers expedition was a fabulous trip with many people learning the skills of whitewater kayaking along the way to enable them to paddle some fun whitewater rapids. The rafters had a ball and we all enjoyed relaxing around the campfires at night on the stunning riverside beaches. The Dharma Circle Trek was indeed an unforgettable experience where our group trekked deep in to the Himalayas in the remote and less touristy area of the Langtang region and spectacular Gosaikunda Lake. The team had an amazing experience with the facilitation of Samantha Coker-Godson from Dharma Circle and we would like to sincerely thank Sam for her wonderful work. We are already looking forward to the 2018 Dharma Circle Yoga, Meditation Retreat Trek! The British Military Fitness ( BMF ) trip in October was a huge success. The crew enjoyed trekking in the spectacular Annapurna region, mountain biking through the windy fun tracks through villages, forests and down to the Kali Gandaki River. The whitewater rafting was so much fun with great rapids, loads of laughs and spectacular scenery. So much fun! 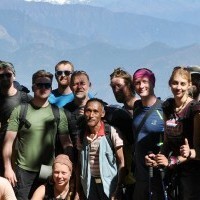 Thanks to Jel for rallying the crew and coming to have adventures with us in Nepal each year! The Tamur Whitewater Rafting trip with Steve and Mark the gang from UK was unbelievable! The team were amazed with views they saw on the trek along the steep windy tracks to the starting point of the whitewater rafting. Staying in lodges along the way on 3000m ridges with views of the mountains was an unforgettable experience. The Tamur as always is the most amazing rafting, kayaking trip with steep fun pristine whitewater rapids which had everyone smiling! Thanks Steve and Mark for an awesome trip again this year. The Europagaai trip was trip lead by Vera Knook together with Ramesh one of our senior guides. Vera has been working with us the past two seasons and we love having her vibrant energy and great expertise on our whitewater trips. The Sun Kosi multiday trip was an absolute blast!! Our community project has been coming along well this year. A big thank you to Leanne Guinea and the girls from Lauriston Girls School for donating $ 1000 towards the latest school building project. This trip was organised by Graeme Howell who got the crew together from the United Kingdom. In Nepal the Sharmila Foundation organised all the logistics on the ground with the help of Ram’s brother Prem and his cousin Shiva for Graeme Howell crew from the UK. Together they built one classroom and spent ten days working on the project. Thanks again to Graeme Howell and his crew for donating their time and effort so the children of Nepal can have the facilities that they need after losing them in Earthquake back in 2015. Lastly would like to thank you all the people who came along in our trips and this helps to generate jobs in Nepal, without you guys all this wouldn’t happen and we are hoping to see you all again somewhere in adventure field. We hope you have a fantastic break over the Christmas and New Year holiday period and re charge for 2017. We have many trips happening next year. Please check our website for the itinerary and trip details. Hope to see you in Nepal next year. Whitewater Kayaking and Rafting Lower Bhote Kosi, Balephi Khola, Sun Kosi and Tamur River.